2017 is the year of firsts for me. I moved across the country, which was also my first time moving, my first flight alone and my first time attending university as a visiting student learning a new language. The plan for my new journey was to fly to Montreal, where I would spend a few days and catch a train from Montreal to Quebec in order to attend my orientation session. Surprisingly I was not afraid of this, yet incredibly excited for this new chapter in my life. While in Montreal, I explored the city for the first time as a solo traveler. Montreal, in general, is a safe city, but coming from a small town in B.C., the idea of being alone in such a big city was frightening. With much thanks to Google Maps, I managed my way around, and found interesting spots that I would normally not have visited, including the Café des Arts, in the Bonsecours Market, next to the Old Port. I felt so free without a time limit; I had the ability to do whatever I pleased. I used the metro to my advantage, starting from Berri-Uqam, the main hub in Montreal, to Lionel Groulx to Peel, visiting and walking past site after site. Place Jacques-Cartier is an excellent street with dozens of tourist shops that sell neat souvenirs from Montreal. Having been to Montreal in the summer and now the winter, I had thought that hiking Mont Royal would have been a great way to see the whole city. Since I grew up in B.C., I had no idea about the snow here. It took me double the amount of the time to walk to Mont Royal. So when I had reached the top, it was close to 4 pm. Therefore, the sun was dropping quickly and so was the temperature, but the stubborn part of me won and I started climbing the long upward trail. Less and less people were around me, but thankfully, I made it to the top before it became completely dark. Regardless of my poor planning, the view was worth the treacherous hike to the top. Luckily, I had previously visited the province of Quebec, which included the city I had now moved to, Quebec City, so I had a basic understanding of the layout. All of that information was lost in my mind as I focused on moving into my apartment for the upcoming months and letting the taxi driver know the right address to drop me off. Being completely disoriented, I tried to use Google maps to walk to the nearest Wal-Mart; however, after an hour of walking the same streets, I took a taxi to and from there, in order to purchase bedding and food. One the day of the orientation for my program, I was given a map of the campus, but in no way was I able to use it to find my way. Luckily there were students heading to the same area, so I followed and managed to find the place I was supposed to check in. There were many international students in the program I was, so we exchanged our contact information so that we could help each other out exploring and conquering the city. That afternoon, I walked around campus and found my way to and from the buildings. I returned back to my room later and called my friends back home to update them. The first day of courses was finally here, and after just looking around the campus for one day, I was still lost. 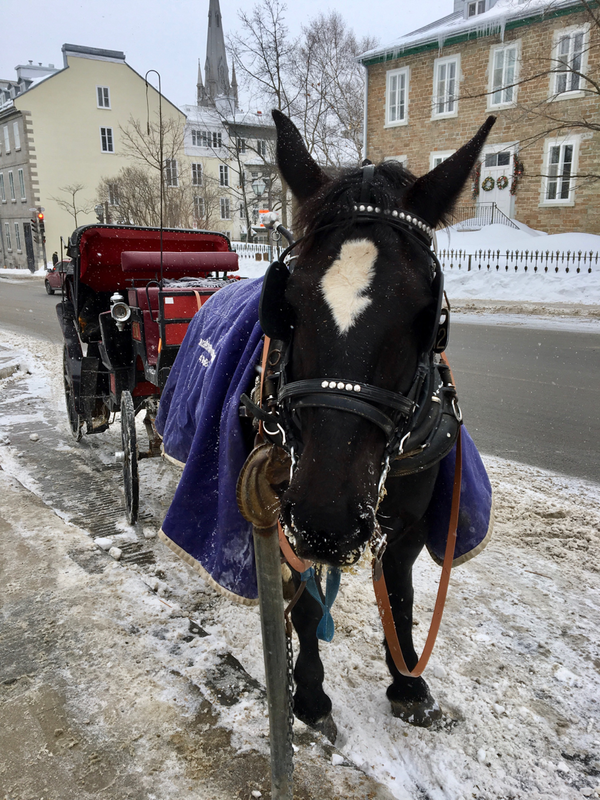 I managed to find a would-be classmate when I was asking for directions, which was very encouraging and so we spent the day learning about each other’s journeys of getting to Quebec. After my class, I was shown how to get to the closest market to buy my groceries, instead of paying for a taxi to and from the mall. During the next few weeks, I took in all the information about the city that I could. The thing that was most challenging for me was learning the bus system. I have my car back home, so I never used the public transportation, so when becoming dependant on it was something I had forgotten to be prepared for. I had no idea where each bus was going, and which side of the street I should be on, however, the bussing in Quebec is easy to learn. The routes head for downtown or the old city, depending on the side of the street. I found that the app called “transit” is helpful for using the public transportation. It works based on your location, so it can use it anywhere in the world. Just type in the destination, whether it’s a stop, address or rough location, it will direct you to the closest buses that are going to that area. It will also keep you alerted to know when to get off the bus as well! The first two weeks after my move were challenging, but I managed to adapt and soon I became confident in going about the city and cooking my own meals, although I am not anywhere close to a good cook. I learned to find some delicious, yet student-budget friendly places to eat, including Âllo Mon Coco, which is located in the Boulevard Laurier, serving huge, delicious breakfast meals that can last you for a few days easily. 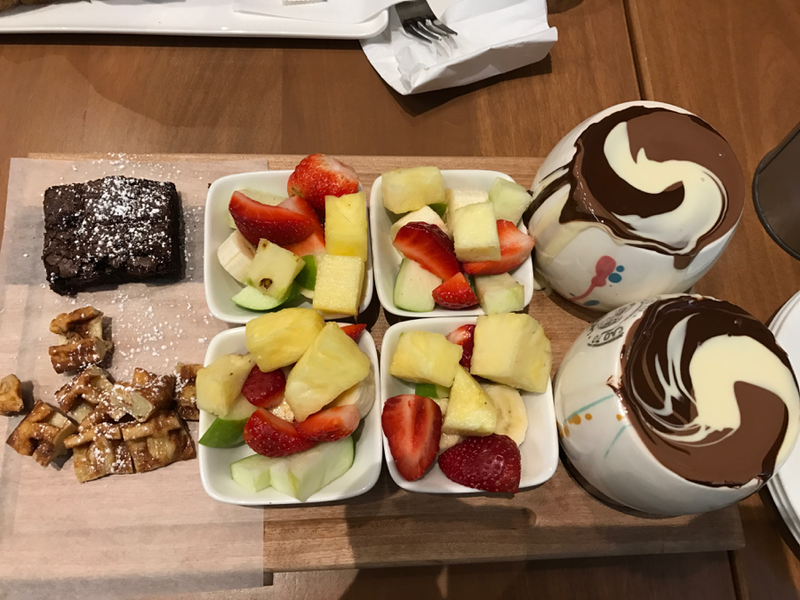 Another amazing place to eat is Cacao 70, which serves as a chocolate specialty restaurant; the “3 Chocolate” Chocolate Fondue is unbelievable. It is also located in the same area as Âllo Mon Coco, but two malls over, roughly a 5-minute walk, in Place Sainte-Foy. 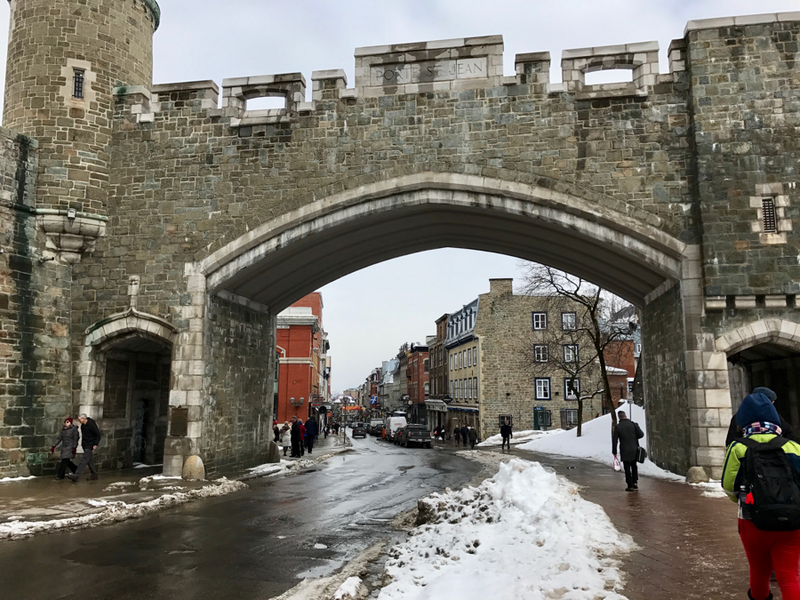 Quebec City, being the tourist city that it is, has many sites to see, so I have yet to complete my checklist of things to do and see here, even though my time is coming to an end. There are hundreds of cafés to choose from; however, my favorite is the Starbucks closest to my place, which is a perfect place for me to complete all my homework for the week. Another good place to go is Nektar Cafélogue, which has the best hot chocolate! It is a little bit farther away, but it is worth the trip to try it out. There are also plenty of historical monuments, being that the city is over 400 years old and that it was a major player in the Seven Years’ War. There are cannon monuments in the upper and lower village, statues of Gandhi, Champlain, Churchill and many other important historical political figures. 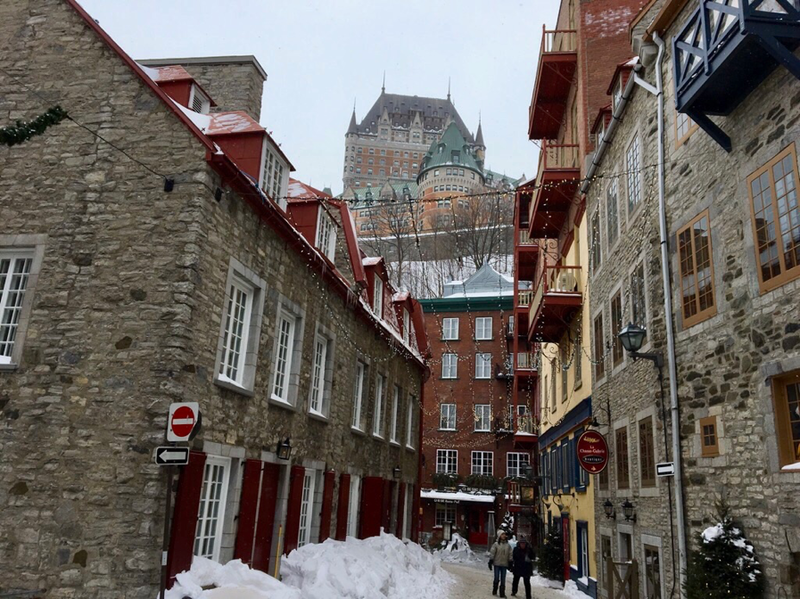 A walk in the walled city of Quebec is also a must, especially since the infamous Chateau Frontenac is located there. 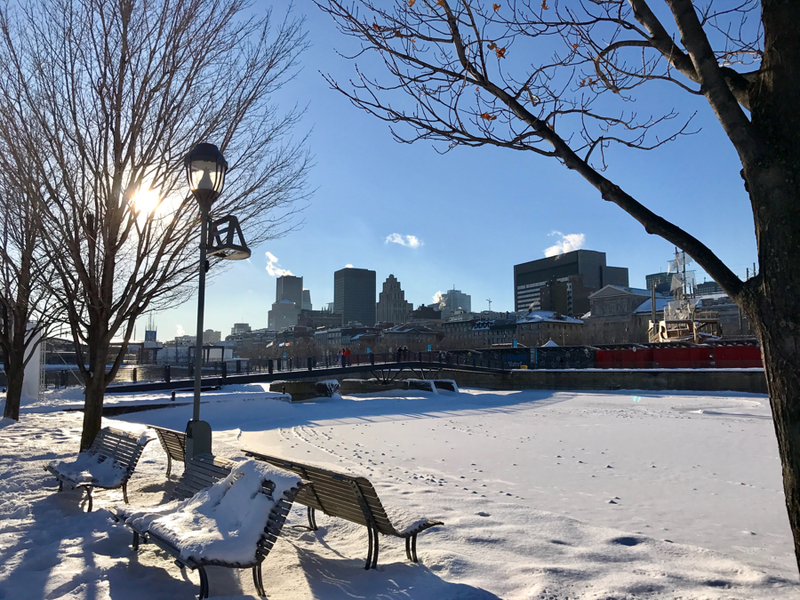 Something to also consider when traveling to Quebec, is that the winter months here are beautiful, however, it is imperative to be extremely cautious, as the snow is often covering layers of ice, so the ground is exceptionally slippery. Also considering that most of the city is located on hills, it is a good idea to be extra cautious in general. To get to the Chateau by driving, you can follow the street Grande Allée, where there is pay parking available on both sides of the street. After parking, just continue walking straight down the road until the Chateau Frontenac comes into view. It should be at the end of the road. By bus, the easiest route is to take the 800 or 801 to the D’Youville stop. After getting off at the D’Youville stop, take a walk down Rue St. Jean past the tourist shops until reaching the Chateau at the end of the street. Looking for another adventure, I decided to try out dog sledding when my parents were visiting. There are many companies here that offer the same experience. We set out to Lévis, which is a thirty-minute drive out to the other side of the St. Lawrence River, where the Aventure Plein Air Inukshuk is located. It was a once in a lifetime experience and everyone in our group had fun. 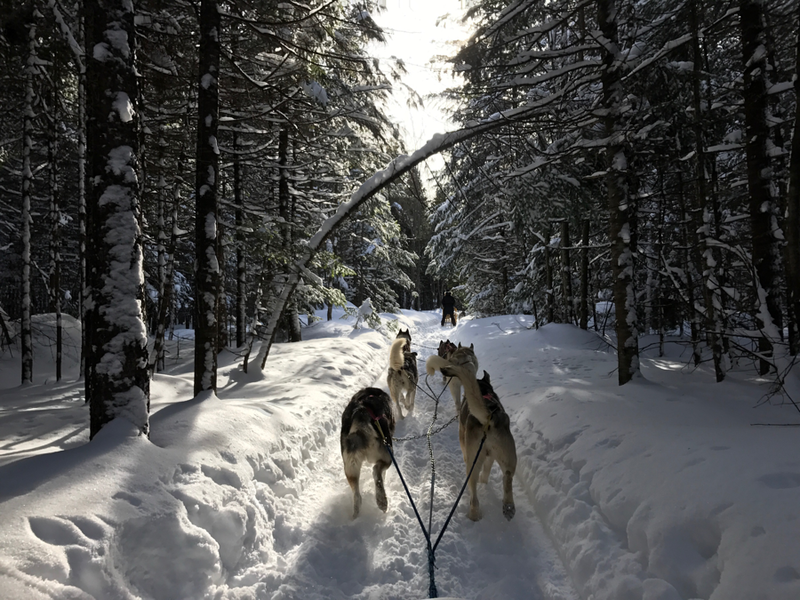 The guides make sure the dogs are well behaved, so there is no need to worry about that part of the activity and just enjoy your time spent in the wilderness. I have only been on my own for a few months now, but the knowledge I have gained will last me a lifetime. Not only have I learned so much about traveling and the French language, which was the reason I moved out here, but I have also learned so much about who I am and who I want to be in the future. Having been a shy person in the past, I now have started to speak up and share my own stories. Through traveling by myself, I have learned to look at life from a broader perspective because at the end of the day, that is what life is about; to learn, to express and to experience the world and all it has to offer.